Leaders from Aroostook County business, educational, social services and faith-based groups have recently begun collaborating on a new initiative with the goal of attracting more families to settle in the region and fulfill crucial workforce needs. PRESQUE ISLE, Maine — Leaders from Aroostook County business, educational, social services and faith-based groups have recently begun collaborating on a new initiative with the goal of attracting more families to settle in the region and fulfill crucial workforce needs. The Northern Maine Growth Initiative is still in its early stages and has no formal status as a nonprofit or organization as of yet, according to member and NMCC President Tim Crowley. 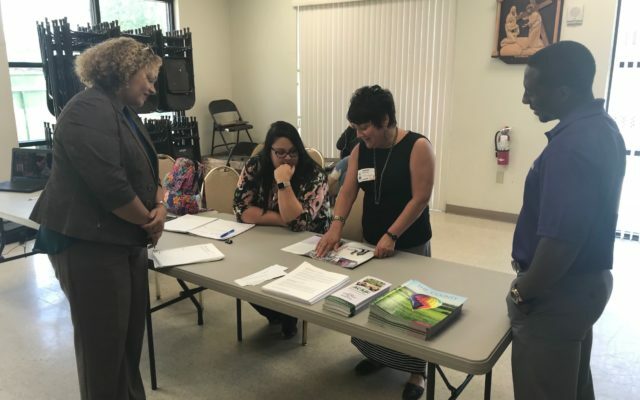 But thus far, he noted, the group has had conversations with officials from Catholic Charities USA in Connecticut and Florida in hopes of connecting four Puerto Rican families with the necessary resources to relocate to Aroostook County by February 2019. Unlike other organizations that focus on economic development in terms of local business development, education or tourism opportunities, the Northern Maine Growth Initiative is focused exclusively on increasing the population of County residents aged 18 to 40 in order to provide a sustainable workforce for current businesses to expand and thrive. Crowley noted that although efforts to encourage young County residents to remain in the region are crucial, officials also must consider ways in which they can attract individuals and families from other parts of the state and country. This past year, Crowley — along with Jon Gulliver, NMDC director of investor and community relations; Jocelyn Haley, human resources specialist at the Eagle Lake and Caribou-based Northern Maine General; and Andre Anderson, NMCC assistant director of admissions — travelled to the Orlando, Florida, region to meet with caseworkers from Catholic Charities USA. While there, they provided caseworkers with information on the workforce and housing opportunities for Puerto Rican families. NMGI is currently planning a similar trip to Hartford, Connecticut, to include Crowley and other group members. Many of those families left Puerto Rico in the aftermath of Hurricane Maria, which made landfall on Sept. 20, 2017, and destroyed infrastructure, thousands of homes and the island’s power grid. Crowley said that although no families have officially decided to come to Aroostook County as of yet, caseworkers have shared information about the region to the families and some have expressed interest in relocating. Crowley calls NMGI a “grassroots” effort that has hopes of potentially reaching out to more families in various cultural communities across the country. He cited a summer 2017 visit from 45 Somali Bantu immigrant farmers from the Lewiston area, coordinated by the Maine Community Foundation and NMCC, as one way in which business leaders have seen the potential in attracting families of various backgrounds. At the time, the Somali Bantu families had come to Aroostook County to visit the SAD 1 Educational Farm and the Amish community in Fort Fairfield and were exploring the possibility of settling in the region for the abundant farmland. Aside from the economic benefits of helping more families settle in northern Maine, Crowley thinks that Aroostook County itself has much to offer non-local people such as affordable housing, educational and professional development opportunities, close-knit faith-based communities, as well as the more quiet, slow-paced setting of small-town life that many might be seeking out. Crowley stated that in past years, higher education institutions in Aroostook County have had some success in recruiting international students who have remained in the region. He cited former University of Maine at Fort Kent athletic director men’s soccer coach Bill Ashby as someone who recruited many international student athletes, including Anderson who is from Jamaica. That trend is something that he thinks local businesses can use to grow and expand through collaborations with community partners.